Smartphone usage continues to soar with the result that consumers, growing used to finding what they want, where and when they want it, are changing their attitudes toward shopping. One consequence of that change in the mindset of the consumer is that marketers are facing a new battleground in meeting the expectations of their target markets; and it’s a fight that, more often than not, they are struggling to win. Those are two of the key findings in an updated report from Forrester, A Marketer’s Guide to the Mobile Mind Shift. The “mind shift” in question represents an irreversible shift in the attitudes of consumers, driven by their use of smartphones to research, evaluate, and purchase the things that they need. Just consider some stats from Forrester to gauge the influence that the mobile device is having on our shopping habits. It is estimated that 70 percent of the U.S. population has a smartphone, up from 48 percent just three years ago. Smartphone penetration is expected to be even higher this year in South Korea (84 percent), Australia (79 percent), and the U.K. (75 percent). US adults spend on average more than 66 hours per month on their mobile devices, visiting 52 websites and using 26 apps in that time. In addition, almost half (46 percent) of all U.S. adults say that they use a tablet, spending 48 hours on websites and apps. 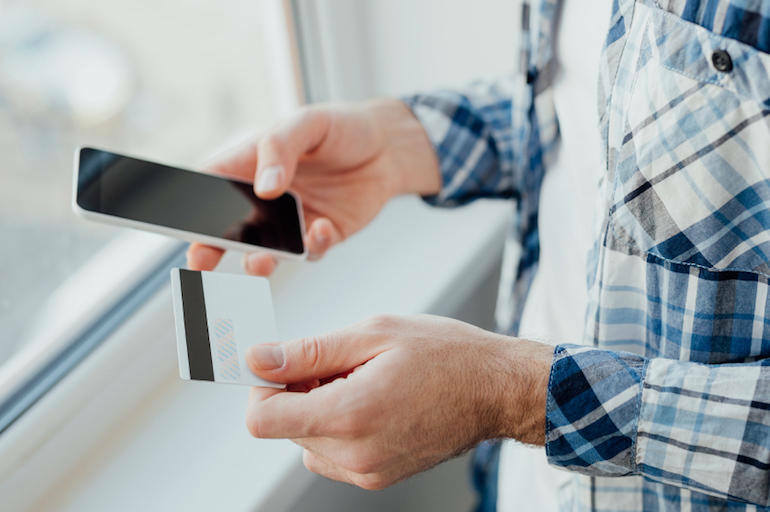 More than a third of U.S. smartphone users (36 percent) use their device to research physical goods at least once a week, while three in ten use shopping apps on a monthly basis. The report concludes that whatever vertical you are operating in, it’s highly likely that these days your customers are making decisions based on information sourced via their smartphone. Now none of this is an indication of a new phenomenon and shouldn’t come as a surprise to marketers. What is surprising, though, is that the Forrester study also suggests that while marketers are aware of the rise of the mobile consumer, they are struggling to find the best way to take full advantage of the opportunities that interaction on mobile can offer. Marketers have a narrow vision of what mobile can represent, viewing it mainly as a stand-alone channel. Too many marketers focus on adapting content to fit the mobile device, with almost half (47 percent) seeing mobile as a “scaled-down” version of their other online offerings. Only 30 percent said they regularly use mobile SEO [eek!]. The vast majority (83 percent) said their company has an app with 13 percent having more than 10 apps. The problem with that is that there appears to be a disconnect between consumers and marketers, with few consumers actually using branded apps according to the report. I don’t use branded apps, do you? If not, why would we think that our customers do? Many struggle with advertising on mobile, despite the relative ease of placing ads in front of mobile consumers on apps like Facebook and Many marketers surveyed said that they were still in the early stages of testing the deployment of mobile advertising. Isn’t that really what we all want when we pick up our mobile devices? The concept of immediate context is critical for the mobile user, who wants to be able to get what they want at a particular moment in time and space. The challenge for marketers is to be able to meet those expectations. Consider these stats that Wise quoted in her presentation. More than two-thirds (69 percent) of U.S. smartphone users say they use their device to search at least weekly. The figure for younger users is even higher. I don’t know about you, but I use my device to search multiple times daily. Almost half of those searches have local intent. One in five users have gone on to compare prices in-store in the previous three months. More than half (52 percent) of users say they would be interested in their phone interacting with a beacon to alert them to special offers. I would definitely be interested in this—what about you? 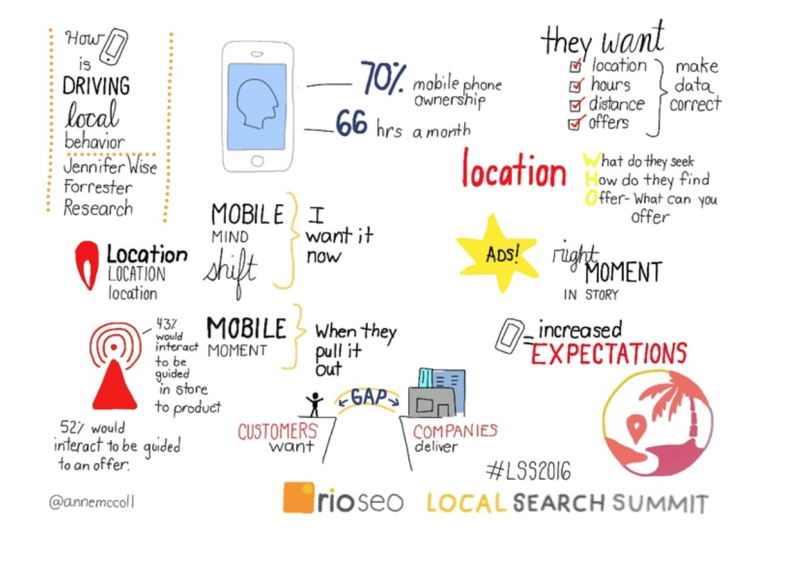 Here’s a terrific graphic from the Rio SEO Local Search Summit that illustrates the above. The Forrester report suggests there is a gulf between consumer expectations and what brands offer up to meet those expectations. Wise says that to be able to bridge the gap, marketers need to be able to understand that location is more than just a physical position; it’s a contextual factor that can be combined with other data to give marketers better insight into the needs of the consumer. To do that, they need to be able to understand what their local target market is looking for, how they search for the information they need, and how their needs can best be met. Whatever tools and data analysis methods are employed to gain that understanding, Wise adds a reminder that current and accurate business information should always be available for searchers. There is no point at all in going to great lengths to find and attract your target consumers, if you are going to turn them away due to a lack of relevant information. It is clear from the Forrester report that while most marketers have grasped the critical importance of the mobile mind shift in consumers, many are still failing to meet the needs of the mobile oriented customer. Instead of viewing mobile as a separate channel, marketers and brands need to adopt a much more strategic and data driven approach that places mobile firmly at the center of their marketing efforts. Only then can they truly reap the rewards that the mobile consumer offers. What has your experience been? Have you seen the smooth integration of mobile into the marketing operations of your organization? Or has your experience reflected that of the majority of marketers who responded to the study? I would be interested to hear your thoughts.